Ask the Readers: When do you Talk about Money in a Relationship? Fried chicken! Wait, this is just wrong! First things first. 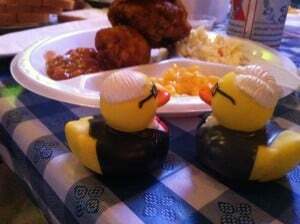 It is time to announce the winners of the Berkshire Hathaway Rubber Duckie sets. Berkshire has 9 letters in it, so the 9th unique comment was the winner of the first pair of ducks. Congratulations to Free Money Minute! Well pleaded, Erin. You have won the second set of ducks. Please use the contact form to get me your address and I will get them mailed out this week. Now back to our regularly scheduled post, Ask the Reader. Last week, in honor of the $550 Million winning lottery ticket, I asked you what you would do if you held the winning ticket. Mr. 1500 chimes in: No Ferrari. I would pick up a used Acura NSX. Cheaper and much easier to maintain. Seems a bit ridiculous to consider maintenance when you would have 100s of millions, but I’d still be under the car, wrenching it myself. I asked if you would keep working, and many said yes, so they wouldn’t get bored. I would love to open a bakery. To not have to be successful would be awesome, because then I could bake whatever I wanted, and if it didn’t sell, oh well. I have $550 Million in the bank. What do I care? I love to bake, but if I have it at my house, I will eat all of it. In one day. Probably by noon. Not good. JC @ Passive Income Pursuit spilled the beans by announcing he did not, in fact, hold the winning ticket. Lots of people mentioned Shark Tank, and wanting to be a Shark or shark-like. I love that show, and would be happy to part with some of my $550 Million for a chance to invest in some of those ideas. I think the sharks have passed on a few really great products. All of this doesn’t even come close to bringing us to this week’s question, but in lieu of a good segue, I will just jump into it. At what point in your new relationship do you bring up money? Anyway, on our way through, we had dinner with Buck and Mrs. Buck of Bucking-The-Trend. (If you aren’t reading his blog yet, add it to your list.) For dinner, Buck cooked us Bobby Flay’s Cuban burgers and my mouth has never been happier! But I digress. Our conversation turned to money (shocker!) and we started talking about relationships as they pertain to money. The number one thing couples fight about is money. What that boils down to is that they have very different ideas about money. One spends more, one is thriftier. They each start to resent the other’s views on money. I have personally seen this numerous times among my family and friends, as I am sure you have. At what point in your relationship do you discuss money, views on money, etc? While it isn’t first date material, how far down the path do you want to go, before you find out the person you have been dating is a spending fool or has massive debt or just doesn’t get it and isn’t willing to change? Wouldn’t it make more sense to discover after date 3 or 7 that his dream in life isn’t to retire early, but is to work for as long as he can, because he wants a designer wardrobe, new car every year, and that Christmas isn’t complete without a trip to Fiji? Do you really want to wait until you “can’t live without her” to find out that she MUST try every restaurant in town, even if you live in New York City? If you are in a long-term relationship, when did you first discuss money? If you are in a new relationship, when are you going to talk about it? We were in college when we got together, and while retirement planning wasn’t the subject of conversation on our first date, being open with our spending and expectations was just kindof par for the course from day 1. 6 months into dating, Mr. PoP helped me shop for my 1st car, and I was very clear on the budget that we were looking in. It was the cheapest car he’d ever looked for, but he was a sport about it and we found a real winner. Little stuff like that started really early, but I think set a good precedent for us being on the same page money wise. You know, I don’t know that we ever actually had a “money conversation” when I was dating my now-husband. But we dated for about six years before we got married, and in that time I think we both could tell how the other valued money — I was always working multiple jobs, we both were still driving our first cars, we didn’t eat at fancy restaurants except on special occasions, he had an IRA long before I did. I think a lot of times you can tell if someone is good with their money just by looking at their clothes, the car they drive, their habits. I think if we had vastly different spending habits, there would have been way more cause for having that conversation earlier. My husband and I were 19 and 22 when we met. I remember telling him about all my medical problems on the third date, but I can’t remember ever talking about money with him. He wasn’t interested in money-management, but was a non-spending type, so he was happy to just cede control to me in that arena. Actually, the bigger problem I had was that he didn’t want to get paid for his work. He used to work as a tutor for the college, and he’d never submit his timesheets to get paid. I used to yell at him about that; he left thousands of dollars on the table. We had some tension when he wanted to quit his job in finance to pursue his music career, but we got over it. He takes very seriously the need to pull his weight around here financially, and he works hard to do so. But he grew up more well off than I am, so I don’t think he gets why I worry about money so much. We were a bit older when we got married – I was 36 (my first marriage) and he was 46 (his second marriage – no kids). We dated 7 years before getting engaged, then married 6 months after that. Never had or have had a “big” discussion about money – just dating that long we knew each others spending habits. We both were good savers, drove our cars forever (my last one 15 years! ), and weren’t designer label snobs. We have been early retired 2 years now and are loving life – it’s easy and no stresses about money. We are set for life! We started talking about money from the very beginning and it has worked out well for us. We always make sure to talk about money and our goals! This can be a really hard topic for a new couple to bring up, because most people are so uneducated about money they wouldn’t know where to begin. My wife and I waited about 6 months before we learned each other’s finances. We were in a unique position (deployed) where money didn’t matter. There was nothing you could possibly want to buy, so it was pretty much off the table. When we returned to the US and began to settle down, finances were a top priority. The only conversation that really matters is the first one. It will give you enough of an idea about a person where you know how they want to spend and if they could be persuaded. If you’re dating a spender and you can tell that you won’t be able to affect their judgment, then you need to make a decision: dump them or deal with it. This is such an important topic. I recently posted on this subject – the post was titled Are You Waiting for your Partner to Change? It largely addressed those of us who didn’t do our due diligence before getting in deep with someone who is a spender. It’s deadly to continue to hope that the other person will change. One of the comments on that post said people should focus on asking about what the other person values and his/her goals rather than coming out of the shoot with money questions early on while dating. That seems like a good approach to me! We started dating in college. Not really sure when money came up. We were, still are really good friends, so we were always able to have serious conversations just regularly. It’s really nice having someone who has similar viewpoints! If you don’t hash things out and have firm ideas about how much money is for personal fun (snowmobiles and 4-wheelers) when the other person wants to replace the roof because the shingles keep blowing on to the driveway then your marriage is in real trouble. Money is the reason I am divorced. Starting the conversation before you move in together is a very good idea, it seems. First of all, thanks so much for the ducks! I can’t wait to receive them :). My husband and I met in college so we were both broke. I am extremely open about money so I think we talked about it pretty quickly. I don’t remember when honestly because we didn’t have any “scary talks”. We were open books from the beginning. We still don’t have any problems talking about money, thank god. Erin @ Red Debted Stepchild recently posted…Happy Memorial Day!